October 2010 awaiting the next patient. October 2010 Don't try this at home! Hand-raised rescued from cubs. October 2010 black bear exam. Becca Micelli conferring with Dr. Emily. PEIVDF visited the Wild Animal Sanctuary (WAS) in Keenesburg, CO on October 30, 2010 for their first mission to this amazing facility. 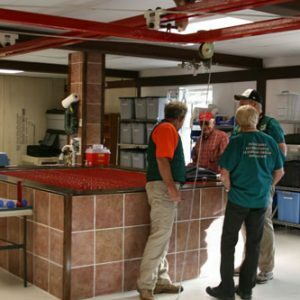 WAS had recently completed construction of a beautiful veterinary clinic and operating room – well-equipped, bright, and perfect for PEIVDF teaching missions. This was the beginning of a mutually beneficial relationship between PEIVDF and the Wild Animal Sanctuary. 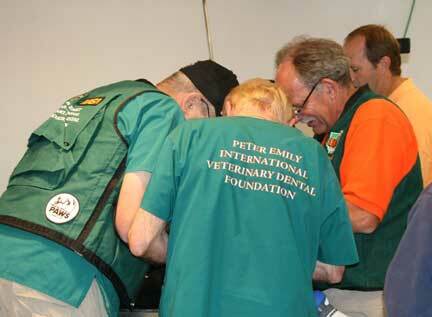 The quality of care given to their animals makes WAS a perfect candidate for PEIVDF’s veterinary dental services. The variety of animal breeds residing at the facility also provide a very varied, hands-on curriculum for our Tuition for Missions students. On September 24, 2018 a team of two travelled to the Wild Animal Sanctuary to work on two black bears recently rescued by the sanctuary. Between them, they needed (3) root canal therapies and (2) surgical extractions, and in no time were feeling a whole lot better. Check back soon for more information on the treatment PEIVDF provided on this mission to improve the health and well-being of the residents at this incredible facility. On September 16, 2018 a team of four travelled to the Wild Animal Sanctuary to work on a grizzly bear with a very painful mouth. Poor Rubia had fractured her four canine teeth to the gum line, prior to rescue by the sanctuary. 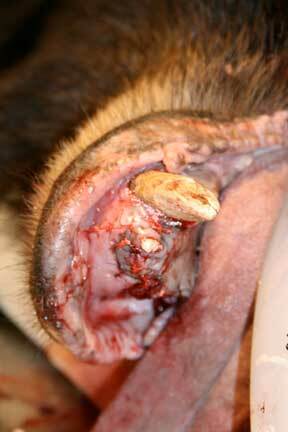 The remaining tooth fragments were shattered and rotting and none could be save. After (4) surgical extractions, Rubia felt a great deal better, and is now enjoying her life at the sanctuary. On August 6, 2018 a team of two travelled to the Wild Animal Sanctuary to work on a grizzly bear. Poor Atze needed root canal therapy on (2) canine teeth, and surgical extraction of (5) molars and premolars, that were fractured beyond saving prior to rescue by the sanctuary. The sanctuary reported he already seemed much more comfortable only a day after treatment. On March 25, 2018 a team of three travelled to the Wild Animal Sanctuary to work on a tiger. Happily, he only needed root canal therapy on one canine tooth. On the weekend of February 10 and 11, 2018 a team of eight, including one paid observer, travelled to the Wild Animal Sanctuary to work on (4) newly-rescued tigers. These were members of a recent rescue by the sanctuary of (39!!) tigers. Two tigers per day were treated, in total with (14) root canal therapies, (1) extraction, (3) gingival surgeries, and (1) restoration. A lot of teeth were saved during the weekend’s work, and all are recovering well and enjoying their lovely new homes at the sanctuary. On January 23, 2018 – right after working on a lion at the Denver Zoo earlier that morning, the team of four travelled to the Wild Animal Sanctuary to work on a tiger. He was treated with (3) root canal therapies. On September 26, 2017, a team of three travelled to the Wild Animal Sanctuary to work on a newly-rescued white tiger. She was treated with (3) root canal therapies and (3) gingival surgeries. 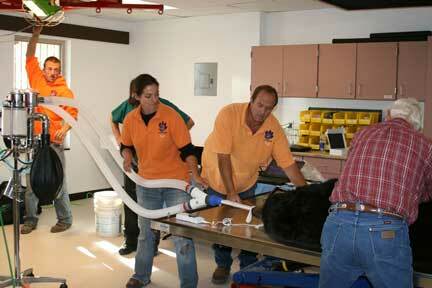 The team also examined a bear while he was being neutered, who happily needed no treatment. On May 15, 2017, a team of two returned to the Wild Animal Sanctuary to work on a lion with a newly-fractured canine tooth. The team was able to save the tooth with a vital pulpotomy and gingival surgery. On February 25, 2017, a team of (6) travelled to the Wild Animal Sanctuary to work on a lion and (2) grizzly bears newly-rescued from Argentina, who bewteen them needed (9) root canal therapies, (9) extractions, (1) gingival surgeries, and (1) biopsy. The combination of vastly-improved diet, large-acreage habitat, dental treatment made a huge difference in their lives, and all were much improved by the next day. 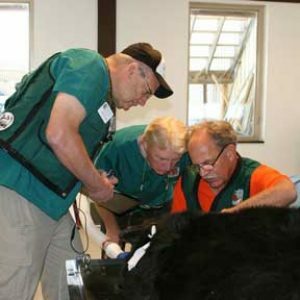 On June 16, 2016, a team of (4) travelled to the Wild Animal Sanctuary to work on a newly-rescued bear and (2) lion who needed (5) root canal therapies, (2) extractions, (3) gingival surgeries, and (1) restoration. All recovered quickly and were much improved by the next day. On November 8, 2015, a team of (3) travelled to the Wild Animal Sanctuary to work on another newly-rescued lion who needed (2) root canal therapies on teeth that had been fractured prior to rescue. The day after treatment he was reported in much better spirits. On October 15, 2017, the team of (2) returned to the Wild Animal Sanctuary to work on a newly-rescued lion who needed (2) root canal therapies on teeth that had been deliberately cut prior to rescue. They had abscessed and were quite painful and infected. The day after treatment his demeanor had improved remarkably, now that he was free from oral pain. On June 17, 2105, a team of (4) returned to the Wild Animal Sanctuary to work on (3) grizzly bear, who needed a bit of work. 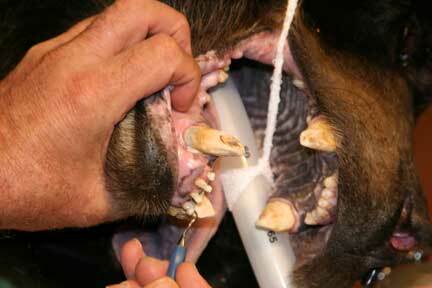 The bear needed (6) root canal therapies, (3) gingival surgeries between them. All were reported feeling much better the next day. 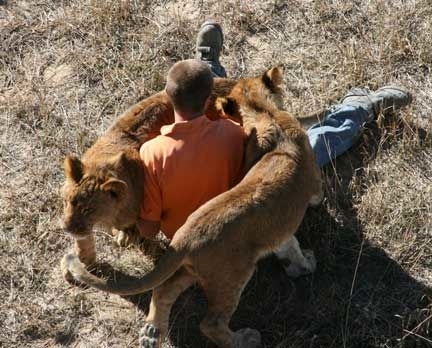 On May 31, 2105, a team of (2) returned to the Wild Animal Sanctuary to work on (1) lion, who needed a bit of work. Poor Masai had suffered a mandibular fracture prior to his rescue by the sanctuary. Unfortunately his prior captors had never repaired the fracture. Masai reinjured his fracture, and it was obvious to the sanctuary staff it needed repair. The damage was extensive and a radical mandibulectomy was performed by Dr. Emily, along with root canal therapy on the remaining tooth fragments. The surgery was incredibly successful. Masai recovered quickly and so well, that he retained his spot as king of his pride. He adapted remarkably well and is easily able to pick up and eat solids meats. 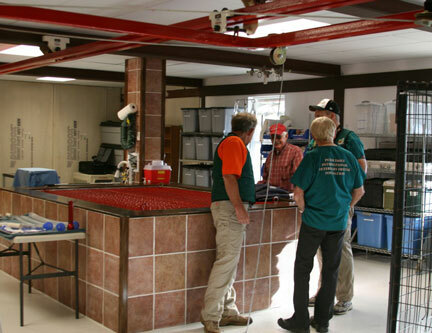 On May 9, 2105, a team of (8) returned to the Wild Animal Sanctuary to work on (2) lions and (2) tigers. Another busy day with lots of work for these new rescues – (5) root canal therapies, (7) extractions, (3) gingival surgeries, and (2) restorations. It was a busy day, but all patients recovered well, and are free from oral pain. On April 16, 2105, a team of (5) were called back to the Wild Animal Sanctuary to work on a mountain lion, a black leopard, and a serval. A lot of work was required on these new rescues – (11) root canal therapies, (5) extractions, and (1) gingival surgery. A lot of work for one day, but they all recovered well, and are no longer suffering from oral pain. On February 17, 2014 the small team of two returned to the Wild Animal Sanctuary to work on another mountain lion. Fortunately, all she needed was a restoration. On November 4, 2013 a small team of two from PEIVDF returned to WAS two work on one mountain lion. A mass found on the roof of her mouth was biopsied, and unfortunately turned out to be inoperable cancer. She lived a wonderfully happy life after being rescued by the Wild Animal Sanctuary. 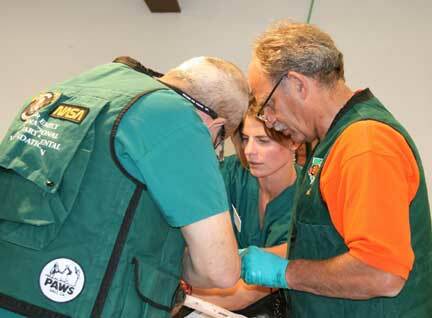 On October 19, 2013 PEIVDF instructors and staff returned to WAS to work on (2) tigers that needed a lot of work. A total of (7) root canal therapies, (2) extractions, and (4) other surgical procedures were performed. A day later, it was reported the tigers were much more energetic and a lot less painful. On September 12, 2013 PEIVDF instructors and staff returned to WAS with one Tuition for Missions students. We worked on (4) sanctuary residents – (2) lions, and (2) grizzly bears. On July 28 and 29, 2012 PEIVDF instructors and staff returned to WAS with two new Tuition for Missions students. On our first two-day teaching mission to WAS, PEIVDF staff worked on (5) five sanctuary residents – (4) four tigers, and one grizzly bear. During this mission, Russell Farrelly of iM3 Veterinary was on had to instruct PEIVDF in the use of its new CR-7 Vet X-Ray developer, generously donated to PEIVDF by iM3. On April 20, 2012, PEIVDF returned to WAS with a small team of PEIVDF staff to worked on (3) three sanctuary residents. Mountain Lion Liberty had two fractured teeth requiring root canal therapy. Elsa – a lioness – required treatment for a periodontal lesion, which entailed bone graft material, as well as treatment for an abscessed tooth. Finally, Raja – a white tiger – required root canal therapy on an upper and lower canine. On August 19, 2011, a small team of PEIVDF staff returned to WAS to work on (3) three sanctuary residents. In addition, Pancho – one of (25) lions WAS rescued with Animal Defenders International (ADI) from deplorable conditions in Bolivia – had only a recheck exam, and has recovered beautifully from his complicated oronasal fistula repair. Hercules, another of the Bolvian lions, had (3) three fractured molars, one of which required extraction. Goldberg, a tiger rescued from Ohio, required root canal therapy on all four canine teeth. 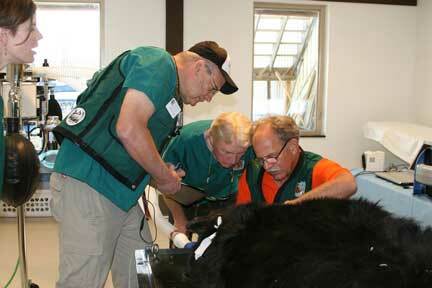 Lakota, a black bear also rescued from Ohio, required root canal therapy for his fractured upper and lower left canines. On March 21, 2011, PEIVDF returned to WAS to work on (3) three more of the (25) lions WAS rescued with Animal Defenders International (ADI) from deplorable conditions in Bolivia. PEIVDF encountered some tough cases on this trip, due to the horrible abuse inflicted on many of the animals in Bolivia prior to their rescue by ADI and arrival at WAS. Temuco and Campeon both required several root canal therapies between them. But poor Pancho! He required the most work, to repair an oronasal fistula – basically a hole that had developed in the roof of his mouth due to the bacteria in advanced periodontal disease. Pancho (as well as Campeon) also had shattered molars that had to be removed. The only way this can happen, the docs surmise, is by trauma to the mouth with something hard like a steel bar!! On February 19, 2011, PEIVDF visited WAS to assess the oral health of the (25) lions WAS rescued with Animal Defenders International (ADI) from deplorable conditions in Bolivia. To the credit of the Bolivian government, after uncovering the horrifying conditions in which circus animals were forced to live, Law 4040 was passed, which bans the used of animals in circuses in Bolivia. To read more about the work of ADI in finding a new home at WAS for these (25) lions. While many of the animals were sedated, PEIVDF took the opportunity to work on (6) of the lions with known dental issues. Several extractions were unavoidable due to the lack of concern the circuses showed for their animals’ health, but 3 root canals were performed. Poor ColoColo had a reputation as the “most ill-tempered lion” anyone at ADI had ever met. Not only did he suffer horrible abuse, but PEIVDF found that he had suffered from a broken canine for some time, judging by the size of the canal. The infection was horrible, and the foul-smelling material filling the canal was unbelievable. It is no wonder ColoColo was in a bad mood. PEIVDF has no doubt that his newly-cared for mouth and the amazing facility in which he and his countrymates are now living will elevate his mood a great deal. 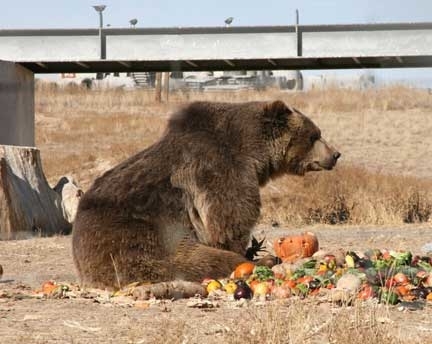 On October 30, 2010, PEIVDF visited WAS to work on one of 25 bears rescued from a private facility in Texas that had fallen on bad times. Standards of care had declined at the Texas facility, leading the state’s attorney general to close down the facility. WAS stepped forward to rescue the bears, as WAS is one of the few facilities in the US able to care for such large carnivores. Bears at WAS have custom built dens for winter – luxury residences by bear standards! Yogi Bear was suffering from severe oral issues – periodontal disease, broken canines, bone loss, leading to grade 3 mobility in many teeth. Such advanced oral disease left Yogi with a dangerous systemic infection, which was evident in his demeanor, likened to depression by his new keepers. One mission worker joined us on short notice to assist and learn. Poor Yogi resisted succumbing to anesthesia as long as he could, and once under, PEIVDF mission instructors, volunteers, and our student began the long day’s work. Yogi’s lower incisors were so loose due to advanced periodontal disease that many had to be extracted – a last resort as far as PEIVDF is concerned. 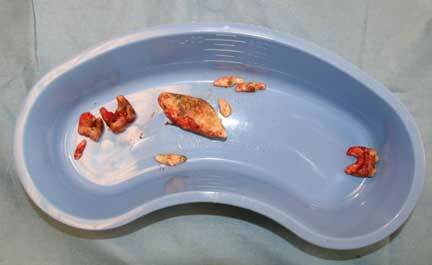 Several molars had periodontal leisions and mobility, as well. In addition to the unavoidable extractions, PEIVDF performed 3 root canals. 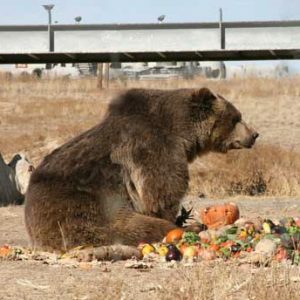 Yogi had a rough night, but Pat Craig, founder of WAS reported he was much improved the next day, enough to eat some soft food by evening. 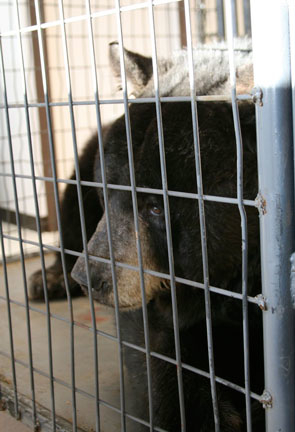 By Monday, Yogi was “peppy” and was released into his large compound for some sun and fresh air. Without the advanced dental work provided by PEIVDF, Yogi’s systemic infection left untreated would have no doubt worsened, and led to heart, liver, and/or kidney problems, and eventually death.